Singing Lessons: Extend Your Vocal Range and Take Your Singing To The Next Level! "How To Extend Your Vocal Range, Eliminate Straining, And Start Singing In Any Key Like A Pro... Guaranteed!" How would you like to quickly and easily expand your vocal range, hit high notes without relying on falsetto all the time, and move across a wide range of tones with ease? Or what if you could sing in any key and as high as you want in your full voice? And what if you could sound good doing it with the right mix of runs and riffs (like you heard in the video clip above)? Probably the better question is who wouldn't get excited about this? "Singing Is One Of Those Things..."
Practically everyone tries to sing at one point in their life. (Yes, singing in the shower counts). We're creative beings. We HAVE to express ourselves. The problem is, since singing is so easy to start doing (all you have to do is open up your mouth and "bam"), it is often learned the wrong way. And much like the piano, you may even be able to get away with sounding good when you are in your comfort zone. That is, "your" key or in "your" range. But before time, you're exposed... sometimes in a very embarrassing way. This is where our course comes in. The Vocal Mastery System not only shows you the basics and fundamentals like developing correct habits, breathing, and dynamics - but it goes even further by demonstrating how to develop your very own unique style and flavor (...we call this "Stylization" and cover several techniques). Too often, when you go to instructors, you're either bombarded with too much of the basics and fundamentals to the point where you're just bored to death BECAUSE YOU JUST WANT TO SING (... and I don't blame you)! Or you learn how to be so proper that your singing doesn't sound natural. I mean, if you're singing classically or on Broadway, this may work but if you're in other genres, you may get laughed off the stage. Even American Idol®'s Simon Cowell commonly refers to some performances as sounding like something from a Cabaret or school musical (no offense... if that's your style, then great). ...And these are just a few frustrations. You're tired of letting your limited range stop you from singing in the original key of a song or modulating to higher keys. You know you can reach further because other people with your same general range seem go higher than you in their natural voice. You have the burning desire and passion but your skill and ability still needs to be honed and you lack the direction to get to the next level. You have to use your falsetto a lot and while you can make it sound pretty, you're still dissatisfied with not being able to sing at higher pitches with your full voice. You start strong but by the end of the song, you're drained. Your ear is decent but you tend to drift out of tune, especially when you sing in the upper registers. You want to stop straining and train your voice to work as it was originally designed to. You've been told to "sing from your diaphragm" but it just doesn't make sense to you. You still don't know if you're doing it properly because you constantly feel tight and strained in the neck area. You've been told that you sing off-key or can't stay in the same key as the song. Or you somehow remember exactly the way the song sounds on the record and if someone plays it in any other key than the record, you tend to be off or bust out singing it in the original key. You feel like you can belt out the notes when you need to but you've realized that you're doing it in a way that's injuring your vocal cords (because you can feel the pain). If any of these frustrations hit home for you, you definitely don't want to miss out on what the Vocal Mastery System has to offer as it addresses each and everyone of these concerns directly. "I Couldn't Sing A Lick"
If you ordered some of our first video courses released between 2003 - 2005 , you'd probably remember my awful attempts at trying to sing certain examples that I was teaching on the piano. Ok, I won't say I couldn't sing a lick. I could hold a note but I just didn't sound good. I would always preface my singing by saying "Ok, I'm not a singer but here ya go!" I struggled with hitting notes outside of my one-octave range. Even when I wasn't on the piano and sang in the tenor section of church and college choirs, I could barely hit my notes without having to push out an extremely loud note. Heck, you couldn't ask me to sing a high note quietly and with control --- It wasn't happening. Take it or leave it. I would imitate people who had great falsetto voices and even convinced myself that I was good at that... until I had to give out soprano and alto notes at a choir rehearsal and got laughed into the corner. The little confidence that I thought I had was gone. Above all, I could feel the strain and the pain that resulted from singing the wrong way. But who cares, because I was always able to go back and hide behind the piano when singing didn't work out. I still had my respect there but always had a secret desire to be able to sing. Singing plus playing, to me, was a dynamite combination. I not only wanted to find someone to help me but since we continually receive e-mails on vocal training, I wanted to find someone suitable to teach all levels of singers. I found someone who was rare. Someone who had the education and degrees in music and singing AND could actually sing. I know it sounds funny but there's folks out there who will teach you all about breathing and little about stylistic singing... or a lot about "support" but very little about sounding better. They know the "fundamentals" and the "theory" but when it comes time to get out there and perform, they lack! Then there's the folks who haven't had a day of vocal schooling in their life but can sing circles around anyone! Those are the two dualities I constantly kept in my mind and I found someone who is SUPERB at both! Nena Lockhart has been singing for over 25 years and describes herself as a "vivacious woman who eats, breathes, and sleeps music." In addition to singing, she is a songwriter, arranger, producer and musician and has performed at venues like the House of Blues, Soul Train, and has worked with Pastor Andre Crouch and others. She received her Bachelors of Art in Music and Singing at California State University, Los Angeles and has since been blessed to work with a variety of record labels, recording studios, and production companies, exercising her gift and love for music. Her ability to break concepts down and demonstrate them in a step-by-step manner is unparalleled. Not only will she keep you awake and at the edge of your seat with her natural enthusiasm and passion for singing, but you'll walk away with thousands of dollars in education. As a company, Hear and Play Music serves over 301,780 musicians from all around the world and supplies over 1.5 million pages of online lessons each and every year! Over 40,000 students rely on our paid courses to teach them cutting-edge techniques without having to pay hundreds -or- even thousands of dollars in classes and private lessons. "Introducing One Of The Most Comprehensive Vocal Mastery Courses Of Its Kind..."
I've teamed up with Nena Lockhart to bring you the Hear & Play Vocal Mastery System, the gigantic course that's finally going to reveal the ins and outs of singing, how to use your voice properly, how to use dynamics and style, and how to unleash the "real" voice hiding inside of you! Who should definitely invest in this course? Anyone who has reached a "glass barrier" in their singing and needs guidance on what to do to join the upper echelon of singers. Anyone who has a decent range but wants to stretch it out to more than three octaves (the average range sits somewhere between an octave and two). Beginners who want to skip the baby steps and start learning the insider tips and tricks to singing that no one tells you. Anyone who is committed to lifelong learning and continually developing their singing skills. Anyone who sounds good but can admit that they are killing the long-term health of their vocal cords by not singing properly. Anyone wanting to learn how to master riffs and runs and when to effectively use them. Click here to order the 10-disc Mastery System Now! "Your Straining Problems Are Over..."
- Triple your vocal range and feel comfortable singing in almost any key you want. Never again will your range limit you from singing in the original key of the song. - Build up your strength and endurance through a series of exercises and drills and never struggle towards the end of a song again. - Use your falsetto strategically and stylistically... not because you HAVE TO! Discover how to add at least a full octave to your range so you can use your full voice when you need it! - How to stand properly and the importance of correct posture. - Diversify your style and dynamics by using both crescendo and decrescendo techniques! Although simple to grasp, dynamics are what separate the experienced from the "American Idol Rejects!" - Avoid drifting out of tune in the upper registers by following 3 easy techniques. -The #1 causes for vocal cord injuries and how to prevent them from happening to you. -How to rid your singing of vocal strain forever. Imagine your singing without straining and having to worry about if you can hit a particular note. - Develop a sense of unpredictability and keep your audience on their toes and at the edge of their seats using some of my professional runs and step-by-step breakdowns. - Discover how to sing properly from your diaphragm, last longer, and have the power to hit notes you never thought possible! - Learn the secrets the pros use to pull off an incredible climax -and- keep consistent energy until the end of the song. -How to avoid strain and pain when trying to belt higher notes. -Common mistakes singers make that hijack their energy and leave them with just a small portion of needed power. - Strengthen your vocal control with quick and easy exercises that'll have people thinking you've been singing for years! - Double your wind capacity...and hold it! Learn Nena's own personal secret to sustain literally any note up to two times longer than the majority of singers out there! - Master the element of tongue positioning and control! This will help you avoid horrible vocal habits such as "lazy tongue" that I've seen ruin plenty of brilliant performances over the years. - Rhythm is a huge part of singing. Learn how to keep tempo and how to use the unique rhythm of any song to your advantage when it comes to using various types of riffs and runs. - Add flavor to your singing by mastering various stylization and "run" techniques that only the pros like Aretha Franklin, Christina Aguilera, Alicia Keys, Kim Burrell, and Beyonce use! - Implement the use of dynamics (i.e.- vibrato, sighs, cries, and straight tones) which will set you apart from the rest. - Spice up your own style by adding signature spiraling runs, riff-to-riff transitions, and the 'tumbling out of an arpeggio' with your own personal finishing touch that will have others looking at you as the veteran! - Learn expert techniques to make sure you NEVER sing a sharp or flat note. - How to use riffs, runs, arpeggios, and other stylization techniques to add loads of flavor to your singing. Once you learn the patterns, you'll be able to come up with your own riffs and runs that center around your own style! Still not convinced that this course can change your singing forever? the ANSWER you've been looking for!" Hear & Play Vocal Mastery 10-disc Audio System truly takes you step-by-step and shows you everything you need to know to start singing the right way. Listen, there is a whole different world out there ready for you to explore. This course will not only introduce you to it but give you several "takeaways" that you'll start implementing the day it arrives in your mailbox. And most importantly, it will equip you with the essential techniques, exercises, drills, workouts, and concepts you need to take your singing to the next level. I've received so many heartfelt e-mails from musicians detailing how their skills have changed because of our courses. How their music directors, church congregation, and even family have noticed the change and taken the time to point out the growth in their playing. While this is singing (I know), I guarantee the same results... that you'll be headed towards the next level and everyone will notice your growth. "I don't do this for others. I want to grow for MYSELF!" But the truth is that there is this little place in each of our hearts that seeks acceptance from others, whether we acknowledge it or not! IT'S THE TRUTH! And if there isn't a part of you that wants to sing better to impress people, then think again! You've seen those "before-and-after" weight loss stories on tv. What if after studying this course, you could compare the old you to the new you and hear a totally different singer --- one who sounds confident, flexible in range, dynamic, and stylish! 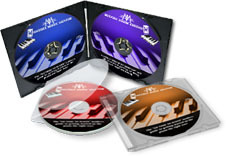 The Hear & Play 10-Disc Vocal Mastery System is broken into 10 sections on 10 audio discs and will explore everything you need to know to start singing at the next level. From the basics and fundamentals to more involved techniques and exercises, you'll get a comprehensive education on the what, why, and "HOW" of singing. Essential Vocal Techniques & Fundamentals For Beginners 101: In this section, you'll learn how to stand (posture), breath, properly position the mouth and tongue, pronunciation of vowels versus consonants, and the importance of facial expression. By the end of this section, you'll have a nice entry-level introduction to proper singing techniques. Essential Vocal Techniques & Fundamentals For Beginners 102: In this 102 course, you apply what you learned in 101 in a variety of exercises that are slightly more challenging. You'll also start exploring various drills like octave slides, which will help you with transitioning between your chest and head voice as well as blending and range. Essential Vocal Techniques & Fundamentals 103: The beginning of 103 focuses on how to sing extremely long phrases without taking breaths (longevity) and exercises you can practice to build up this skill. You also learn how to make sure each note you sing is precise and not in between pitches. Also, to avoid the common "Lazy Tongue" or "Lazy Mouth" problem, a series of exercises like "Butterflies" are introduced. Vocal Stylization Techniques: Dynamics 101 - On this cd, you learn the basics of dynamics and why it is important to use such techniques in your singing to set you apart. Nena takes you through 3 exercises along with tons of activities and application to perfect your stylization skills. By the end of this section, you'll learn a series of techniques involving energy usage, manipulating volume, sighing, crying, straight tones, vibrato, and many more. Vocal Stylization Techniques: Dynamics 102 - In this section, you will delve even deeper into the world of dynamics as you study crescendos, decrescendos, accents, enunciation of consonants, breath marks, and my more techniques. Each concept is accompanied by a number of exercises, which break into activities and real-life application and examples. Vocal Modes & Scales 101 - Here, you'll learn several common modes that you can use to further your singing ability. Understanding modes allow you to know where you're going so that you don't end up hanging on to some strange pitch while the song has progressed elsewhere. How to turn what would be risky into confident runs and ideas based on modal scales that always work! Referenced by Nena as the "bootcamp" cd, this section will contain many scale and modal drills to whip you in shape! Vocal Riffs, Runs, & Arpeggios 101 - In this basic technique cd, you will learn steps that will catapult you to the next level of stylization. You'll discover the backbone of various arpeggios, riffs, and runs by learning a few unique patterns. By understanding these patterns and being able to sing them, you'll be able to add countless amounts of style to your singing. Vocal Riffs, Runs, & Arpeggios 102 - Leaving from where the 101 section ends, this cd takes you through even more exercises and activities that introduce you to further riffs, runs, and arpeggios. You learn about ascending versus descending arpeggios, riffs and repeated phrasing, and how to create your own runs with knowledge you've learned so far. You also incorporate a number of vowel and consonant sounds to create endless possibilities. Professional Runs 101 - Using what Nena calls the "Running Game" and mimicry, you are taken, step by step, through a number of professional runs and taught how to break them down into smaller chunks to digest. These are runs that let people know you're in the building and once you learn them and start creating your own, you will see just how powerful they are. You also learn the importance of timing and usage (and over-usage) of runs. Professional Runs 102 - Here, you are performing advanced runs and tricks that incorporate everything you've learned from past sections like proper posture, breathing, octave drills, timing, rhythm, vibrato, crescendos, decrescendos, sighs, cries, and more! By the end of disc 10, you will have taken your singing to new heights. If you perfect just two of the runs Nena introduces, this entire system would pay for itself many times over! That's how awesome these professional runs are! If you enjoyed the short youtube video demonstration above of Nena's singing, then you will absolutely love the extra 45 minutes in online videos we're throwing in for free! These videos include additional exercises you can employ to improve your breathing, transitioning, and vocal range. You will be given access to a private members area where you can watch this bonus 45 minute video instruction online as much as you want. Just to make sure you don't miss a single note, we've hired a transcriptionist to literally type out, word-for-word, everything that Nena says in the 10-disc, 7-hour course. I'm talking about explanations, examples, exercises, concepts --- EVERYTHING! So when you're not actively participating with the course, you can be reading through the transcripts to review the material. That's over 120 pages of transcripts yours for free. As a very special one-time bonus, I'd also like to send you three free courses from my Monthly Music Mentor CD of the month program, which will help you to be equally equipped on the music side as you'll be on the singing side of things. The Monthly Music Mentor program is aimed at teaching you everything you need to know to play music in the quickest and easiest way possible. Just as it sounds, this program was designed to take you by the hand and "mentor" you step-by-step through the musical process of playing by ear. If you lack time and want to make the best of the limited time you have, you're going to love what these monthly cd lessons will do for you. Everyone knows the best singers are also musically inclined so these bonus courses will compliment your vocal lessons by not only giving you the musical foundation you need to excel in your singing, but they'll also give you the ability to back yourself up on the piano, if you need to. If you're serious about getting to the next level in your singing, then you won't have a problem with this deal at all. In fact, you will love this offer because not only am I dropping the price of this comprehensive training course a considerable amount, but if you order today, I'm also throwing in the online video training and word-for-word transcripts of the entire course, as described above. Plus, you'll get the additional 3 Monthly Music MentorTM courses valued at $79.95. So you're not only getting 7.3+ hours of step-by-step audio material on proper singing and technique, but an additional 4.5 hours of audio training in free cd bonuses and an additional 45-minutes of online video lessons. Then there's the ongoing support of the program --- what else could you possibly ask for? For all of this, I could very well charge over $399.50 and still get tons of orders for all 10 discs, the additional $188.90 in bonus courses, and online video footage and transcripts. With values at $39.95 for each disc (totaling $399.50, which is actually cheap in this instructional industry), that price would be well justified. But I'm not going to charge you $399.50 for this monster 10-disc set and bonuses. I'm not going to even charge you $150.00. For just $197.00, this entire 10-Disc Hear & Play Vocal Mastery System plus the bonus package, word-for-word transcripts, and free courses can be yours. UPDATE: To celebrate the release of our first vocal course, we are slashing the price down to 3 easy monthly payments of $45 for the next 300 orders. This special is subject to change at any time. This National Introductory Price is subject to change at any time so if you're really interested in this vocal mastery system, I suggest you act quickly --- otherwise, you might end up paying $197 or even the retail value of $399.50 in the future. Even worse, you may be too late and not able to take advantage of this bonus package at all. We're talking about 7.3 hours of step-by-step instruction, online video clips, word-for-word transcripts, free music courses, and more! And heck... compared to hiring a vocal instructor at $50 per lesson, you will have spent that in no time! In fact, $365.00 for 7.3 hours of private lessons if you wanted to go that route. What you learn in our comprehensive 10-disc system can never be taught by a conventional vocal coach so even if your budget allowed for private instruction, you would waste time learning things, styles, and genres you don't want to know. You'll be lucky if, after your 7th lesson, you've moved on to really incorporating things that actually have you singing better. Because Nena comes from both sides, you get both the academic side mixed with the "school of hard knock" information that allows you to learn in months or even weeks what took other singers years to figure out! You can't learn the shortcuts we're teaching you at a university, even if you forked over thousands of dollars in tuition fees. This is specialized knowledge that only a privileged few know --- and now you have the opportunity to join the inner circle of trained singers. Even though the price is extremely affordable, here's what's really important. If this Vocal Mastery System was just another course that just sat in your bookshelf and didn't teach you anything new, it wouldn't matter what the price was. IT WOULDN'T BE WORTH ONE SILVER PENNY. On the other hand, if you can learn just ONE or TWO things that revolutionizes your singing (or get you started the right way), it's worth its weight in gold. There is no other form of learning that can give you what I'm offering for under $150.00. When I release courses, I want to make sure that you're getting back in information and helpful resources & tools at least two to three times what you invest. That is always my goal and I sincerely believe this is one of the best values you'll ever come across. Have you reached a "glass barrier" in your singing and need guidance on what to do to join the upper echelon of singers? Do you have decent range but want to stretch your range to more than three octaves rather than staying at the status quo of about one to two octaves? Are you a beginner who wants to skip the baby steps and start learning the insider tips and tricks to singing? Do you sound good but admit that you are killing the long-term health of your vocal cords by not singing properly? Do you want to learn how to master riffs and runs and when to effectively use them? The only way to guarantee that you'll receive the bonus and the National Introductory Pricing is to order today. If you come back later and the terms have changed, there is nothing I can do about it. Your package is shipped via USPS Priority Mail. You will receive the Hear & Play Vocal Mastery System in a week or so and you can get started learning the same day you receive it. You can literally be on your way to taking your singing to new levels in no time! P.S. - If you're wondering, "How can I justify this purchase? ", then I just want to leave you with one last thought... At 3 monthly payments of $45, you deserve it! That's all I have to say. If you've read this far, you're clearly serious about investing in our course. No one is stopping you from this but you! It's 10 discs and 7.3 hours. That's barely $18 an hour (versus $60 an hour). Who can you pay for that amount and will they rewind themselves over and over? :) Click here to order now.